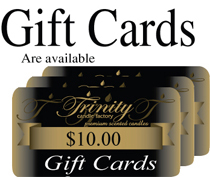 Send a friend or loved one a Trinity Gift Certificate. Simply add your information and a sweet note and the recipients email. Select amount from $10.00 to $500.00 and checkout. Once finished we will email their certificate # with amount and they can shop at www.trinitycandle.com . Its a quick and easy way to send a gift for any occasion.